The Universe is vast and largely made up of empty space, but cosmic collisions still happen pretty often. Take the galaxy in this picture: it looks like a giant target board, and some 300 million years ago, a smaller galaxy scored a cosmic bullseye when it crashed right into the center of it. 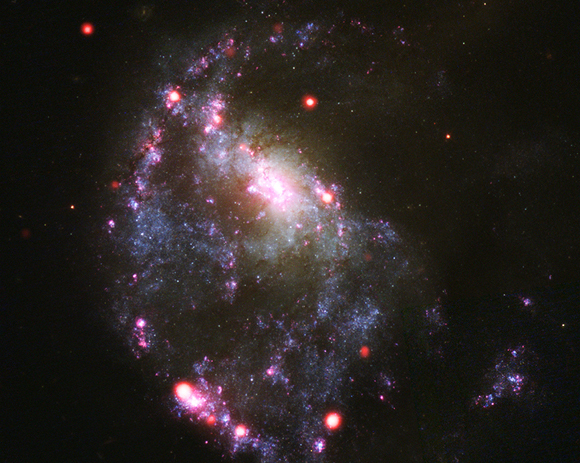 This galaxy began its life as a spiral galaxy. It had several long winding 'arms' of stars and dust wrapped around its center, like the galaxy in this picture . But the impact of the smaller galaxy disturbed the tidy lanes of stars and the neat galactic center and warped the galaxy into this sloppy ring. You can see that the bright, gassy center of the galaxy has been pushed to one side and the spiral arms have been twisted into a chaotic mess. What is left of one of the spiral arms can be seen extending upwards, out of the top of the galaxy. The collision also set off a ripple effect, like when you throw a pebble into a still lake. The disturbed gases throughout the galaxy triggered a chain reaction of star formation. Hundreds of enormous new stars were born. You can see these as bright red regions in the image. Cool fact: The Milky Way is also destined to get a major makeover, 4 billion years from now, when it collides with our nearest galactic neighbor, the Andromeda Galaxy. The Sun will probably be thrown into a different part of the galaxy. Can you imagine seeing a totally different night sky? 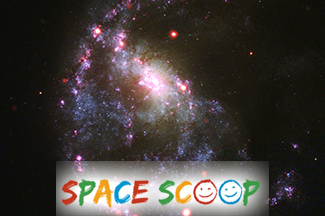 This Space Scoop is based on Hubble and NASA Chandra X-ray Observatory Releases.